My Family Fun - Happy Feet Tap Dancing Penguin Feet Start dancing with the beautiful Penguin Feet! 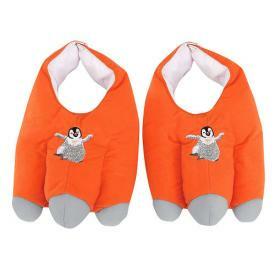 Start dancing with the beautiful Penguin Feet! Just slip them on and start dancing - the motion sensor in the feet detects movement and tap dancing sounds will begin to play. Additional sound effects include Mumble's voice, musical tunes and a song clip of "Jump N" Move". The shoes are adjustable to fit most sized feet. Our Recommended Age: 4 - 8 years!